Will Gallagher has a positive plan to make Chester an even better place to live. 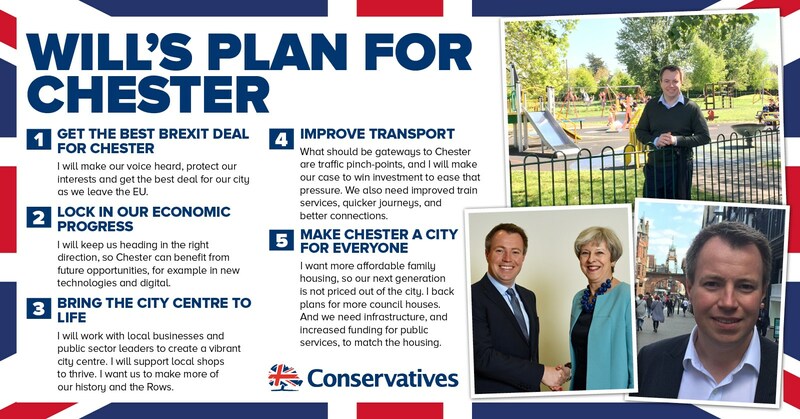 At the heart of Will's five-point plan is making sure Chester has a strong voice in Parliament who can work with the Government to improve the quality of life for people in our city. "I'm proud to call Chester home. Ours is an amazing city with so much potential. But there is a lot more we need to do to improve the quality of life for families right across Chester. "That's what My Plan for Chester is all about. It focuses on the things I know matter to our city: having a voice in the Brexit negotiations, locking in our economic progress, supporting our city centre economy and improving transport links. "These issues have been at the heart of my campaign and, if elected on June 8th, they will be my priorities in Parliament."